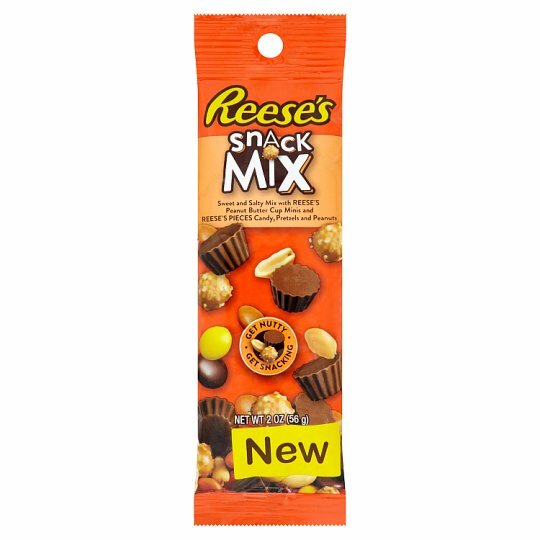 A sweet and salty mix of Mini Reese's Peanut Butter Cups (34%), Reese's Pieces (25%), Pretzels (21%) and Peanuts (20%). Mini Reese's Peanut Butter Cups - Peanut Butter Creme in a Milk Chocolate Flavoured Coating. Tartrazine (E102), Allura Red (E129) and Sunset Yellow (E110) may have effects on activity and attention in children.